The “Perfect Pair” package is available with South Walton and Destin vacation rental stays of four nights or more at participating Newman-Dailey properties. The Perfect Pair package includes a stay in a one-bedroom or more Destin vacation rental home or condominium and a $100 Silver Sands Premium Outlets gift card. Newman-Dailey Resort Properties and Silver Sands Premium Outlets in Northwest Florida have teamed up to launch the Perfect Pair package available with South Walton and Destin vacation rental stays of four nights or more at participating Newman-Dailey properties. The Perfect Pair package includes a stay in a one-bedroom or more Destin vacation rental home or condominium and a $100 Silver Sands Premium Outlets gift card to put toward the purchase of a pair of new shoes or any other product or accessory. With one of the largest collections of premium brand stores in the nation, Silver Sands Premium Outlets features the latest fashions at up to 65 percent off retail prices. For those seeking a trendy pair of boots (tall, glitter, white, combat, plaid, leather, suede or embellished), Silver Sands Premium Outlets’ stores will likely have them. For those not in the market for boots, Silver Sands Premium Outlets features a vast selection of shoe styles, including athletic footwear by Nike, Reebok, New Balance, Converse, Adidas and Under Armour, among others. Located in Miramar Beach, Silver Sands Premium Outlets stores featuring footwear include Adidas, Allen Edmonds, American Eagle Outfitters, Asics, Banana Republic, Bass, Clarks, Cole Haan, Columbia Sportswear, Converse, Crocs, ECCO, Gap Outlet, J.Crew Factory, Johnston & Murphy, Journeys, Merrell, New Balance, Nike, Nine West, PacSun, Rack Room Shoes, Reebok, Saks Fifth Avenue OFF 5TH, San Antonio Shoemakers, Saucony, Skechers, Sperry Top-Sider, Tommy Hilfiger, Under Armour, Vera Bradley and Vans. 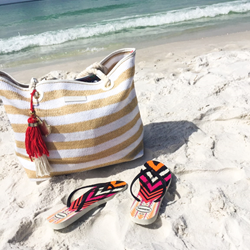 For those who purchase the perfect pair, there are plenty of places to wear stylish shoes in and around Destin. Fine dining is abundant at South Walton and Destin restaurants, including Emeril’s Coastal Italian, Seagar’s, Cuvee Kitchen & Wine Bar, Vue on 30A, Café Thirty-A and Trebeache, among many others. For those who purchase athletic shoes, running and biking along beach bike paths and trails are popular pastimes and the perfect place to break in new shoes. The Perfect Pair package* is a limited time offer and available with stays of four nights or more now through November 18, 2017. View Newman-Dailey Resort Properties vast selection of South Walton and Destin vacation rentals online, including rentals at Hidden Dunes Beach & Tennis Resort in Miramar Beach. Book direct for best price guarantee. When booking online, use promo code: PERFECT17 or call 1-800-225-7652. *Some restrictions apply.